mathjokes4mathyfolks.com :: live. laugh. learn. Math Jokes 4 Mathy Folks is a website dedicated to making math fun. Of course, I happen to believe that math is fun, so the real purpose of this site is to expose the fun that already exists within mathematics. My name is Patrick Vennebush, and I'm the owner/author/webmaster for Math Jokes 4 Mathy Folks. I hope you like what you find here, and I hope you have a little fun during your visit. 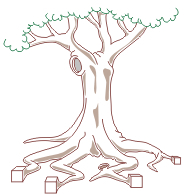 Ever seen a tree with cube roots before? Neither had I, so I decided to make one. I like math, and I like to share and solve math problems. I get involved with all kinds of miscellany, from optical illusions to visual cryptography. I like to ask "Why?" and then search for an answer. And I like to ask other people "Why?" and watch their wheels start to turn. When not solving problems, telling jokes, or playing ultimate, I manage online projects for the National Council of Teachers of Mathematics. I have a Masters Degree in curriculum and instruction from the University of Maryland. I live in northern Virginia with my wife Nadine, who laughs at 80% of my jokes; my twin toddlers Alex and Eli, who only appreciate 20% of my humor; and our golden retriever, Remy, who has never been very good with percents.